Hey EPA, Keep the Mercury Standards! Mercury is well known as being a toxic metal. According to the U.S. Government Agency for Toxic Substances and Disease Registry, mercury is ranked third behind arsenic and lead in terms of human health risks. Yet it continues to be dumped into our waterways and soil, released into our atmosphere and water, and then subsequently bioaccumulates in our food. Today, we can find it in weather instruments, mercury vapor lights on roadways, in medicine, in electronic equipment, and in the production of certain chemicals. Mercury used to be added to paints where it served as a fungicide. In June of 1990, the EPA banned the use of mercury as a biocide in interior latex paints. One instance found that a paint used used in a toddler’s room contained 900 ppm of mercury, three times the safe level. The child was hospitalized for months due to mercury poisoning. If you were born in the 1950s, most of your cavities were filled with a mercury amalgam; a mixture of 50% mercury and a silver-tin-copper alloy. Today, most dentists do not use this material and many people have opted to have their old mercury fillings replaced with a safer composite material. Years ago, high school chemistry labs had jars of elemental mercury or old mercury thermometers in their sample prep rooms. The surface tension of mercury is high and mercury in liquid form will maintain a spherical structure. Some of us may have played with those spherical blobs of mercury, but elemental mercury is not a toy. In the late 1990s, a program was instituted in Ohio to remove mercury, along with many other toxic compounds, from all high school labs. An internet search will reveal that there are numerous incidents of mercury contamination and spills in many schools across the country. Today most schools do not have elemental mercury, or barometers, manometers, or thermometers that contain mercury. Mercury can combine with non-metals to form salts such as mercuric chloride. This was used to treat syphilis before penicillin was available. Mercury can also be found as organic mercury compounds known as ethylmercury and methylmercury. These compounds are forms of elemental mercury combined with carbon. Both compounds are very toxic and formed when elemental mercury is released into the environment. Once mercury is exposed to naturally occurring anaerobic bacteria found in soils, sediment, and water, it can become methylated. These anaerobic bacteria can actually splice methyl groups (methane molecules lacking one hydrogen) onto a mercury atom, forming methylmercury. Because the carbon coating on methylmercury is similar to living carbonaceous material (our skin), it can be easily absorbed into the body. Most of our exposure to methylmercury comes from ingestion by eating fish and shellfish that have been feeding in waters subjected to mercury via air pollution. That airborne mercury originates primarily from the burning of coal in coal-fired power plants. Ohio is second only to Texas in the amounts of mercury produced from electrical power generation. In Ohio, all bodies of water in the state have some amount of mercury pollution from coal burning power plants. According to an EPA report, “Every fish sample tested from Ohio and throughout the nation was contaminated with mercury.” Several of Ohio’s most popular sport fish contained mercury levels that exceed the US EPA’s “safe” limit for women of childbearing age, including 48% of the walleye, 49% of the smallmouth bass, 50% of the Northern pike, and 64% of the largemouth bass.” Unfortunately, many citizens of the state disregard these warnings and consume larger than recommended quantities of fish caught in Ohio waterways. 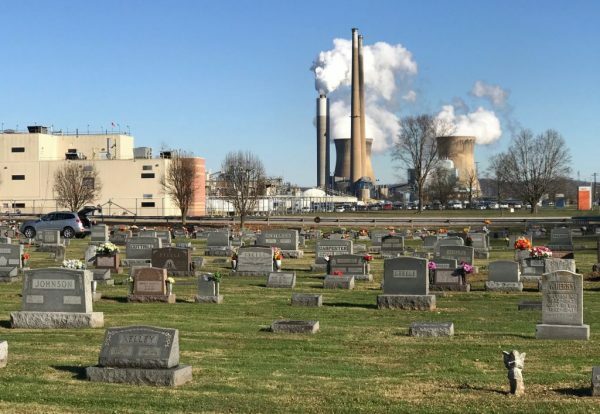 West Virginia’s rivers and streams, especially the Kanawha have also experienced contamination from wastes generated from coal-fired power plants. Those wastes contain, amongst other toxic substances, significant amounts of mercury. According to a recent article in the Columbus Dispatch, many coal mines in the West Virginia, including ones that have been closed, continue to generate wastes and will for decades to come. Another source of mercury emissions that has basically gone unnoticed, is the oil and natural gas industry. Just like coal, these fossil fuels were created during the Paleozoic Era. Plants and animals died and their remains along with other impurities like mercury were deposited. Millions of years of heat and pressure transformed this material into our oil, gas, and coal deposits. When these fossil fuels are burned or released into the environment via a spill, there is some mercury released as well. When I was a teenager I read a pretty disturbing article in Life Magazine. It was a photo essay entitled “Death-Flow from a pipe.” The photographer, Eugene Smith, chose a cover photo showing a black and white image of a mother in Minamata, Japan, bathing her emaciated adult daughter. The daughter was a victim of mercury poisoning; poisoned in her mother’s womb. She was deaf, blind, and unable to use her legs. Minamata, Japan is a fishing village on an island adjacent to the mainland. In the early 1900s, a chemical company established a factory near the small town. The factory grew into a major chemical producer for Japan. For decades, it dumped its wastes into Minamata Bay. As early as 1925, the local fisherman began to complain about the pollution. Their complaints were ignored. By the 1950s, both aquatic and land species of animals where showing ill-health effects. Villagers were also reporting insanity, paralysis, coma, and death, along with birth defects in their population. People recounted stories of cats and pigs going mad. In a society where dissent is frowned on, it took years for many of the victims of mercury to come forward. Even then, the company never fully accepted responsibility for the pollution and poisonings. Ingested mercury will bioaccumulate in the body and can lead to significant health effects such as cellular, cardiovascular, hematological, pulmonary, renal, immunological, neurological, endocrine, reproductive, and embryonic toxicological effects according to a 2014 article published in the Journal of Preventive Medicine and Public Health. Mercury is one of many contaminants found in the Ohio River and one that is monitored by the Ohio River Valley Sanitary Commission or ORSANCO. Data on the amounts of mercury found in water samples and fish tissue can be found on the ORSANCO webpage. This data is used to issue fish consumption advisories which are also published on their webpage. Its reassessment showed the cost of compliance with (Mercury Air Toxic Standards) MATS was between $7.4 billion to $9.6 billion annually, while the monetized benefits were between $4 million to $6 million. In contrast, the Obama era EPA monetized the annual health benefits at $80 billion. Paracelsus, an alchemist born in 1493 and the father of modern toxicology said. “The dose makes the poison.” In the case of mercury, the safe level for a 132 pound woman, according to the EPA, is 6.0 mg per day. The Ohio Department of Health advises that everyone limit consumption of sports fish caught from all bodies of water in Ohio to one meal of fish per week. Given the toxicity of this element and the costs to human health and the environment, rolling back MATS is a bad idea. EPA will accept comments on the proposed rule for 60 days after publication in the Federal Register. The publication of the rule has been delayed due to the shutdown, but once it publishes, the public will have 60 days to comment. Watch here for updates. Comments should be identified by Docket ID No. EPA-HQ-OAR-2018-0794 and may be submitted by one of the following methods. Online: Go to https://www.regulations.gov and follow the instructions for submitting comments to EPA-HQ-OAR-2018-0794. Email: Comments may be sent to a-and-r-Docket@epa.gov. Include Docket ID No. EPA-HQ-OAR-2018-0794 in the subject line of the message. Mail: Environmental Protection Agency, EPA Docket Center (EPA/DC), Mail Code 28221T, Attention Docket ID No. EPA-HQ-OAR-2018-0794, 1200 Pennsylvania Avenue, NW, Washington, DC 20460. Fax: Fax your comments to: (202) 566-9744. Attention Docket ID No. EPA-HQ-OAR-2018-0794. Hand/Courier Delivery: EPA Docket Center, Room 3334, EPA WJC West Building, 1301 Constitution Avenue, NW, Washington, DC 20004, Attention Docket ID No. EPA-HQ-OAR-2018-0794. Such deliveries are only accepted during the Docket’s normal hours of operation, and special arrangements should be made for deliveries of boxed information.